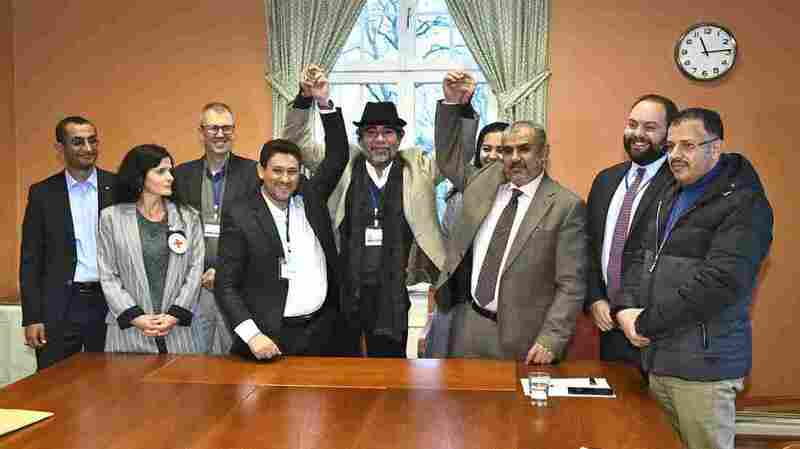 Yemen's Warring Sides Shake Hands On Deal To Swap Thousands Of Prisoners Both sides in Yemen's conflict are meeting in Sweden for their first face-to-face talks since war broke out in 2015. Yemenis face the "worst humanitarian crisis in the world," according to the U.N. Representatives of the Houthi rebel delegation (left) and the Yemeni government's delegation (right) pose for a picture with representatives from the office of the U.N. Special Envoy for Yemen and the International Committee of the Red Cross on Tuesday, during peace talks at Johannesberg Castle in Rimbo, Sweden. There were scenes of raised hands and smiles from Yemen's warring sides as they met Tuesday in a Swedish castle for U.N.-brokered peace talks. The two sides announced they will exchange thousands of prisoners in late January — a move that could be a small step toward relieving the suffering of millions of Yemenis caught in civil war. The swap will reportedly involve some 15,000 prisoners. According to Reuters, envoys said it "would be conducted via Houthi-held Sanaa airport in north Yemen and government-held Sayun airport in the south — a process overseen by the United Nations and the International Committee of the Red Cross." The war began in 2015 when Yemen's Houthi rebels took over the capital city of Sanaa and forced the Saudi-backed government to flee. Saudi Arabia retaliated by launching an air and ground offensive, prompting a steep escalation in the violence. The Houthis are backed by Iran, and the war has turned into a stalemated proxy battle. Both sides have killed civilians, with the Saudi-led coalition blamed for bombing schools, markets and hospitals. There have been previous peace negotiations, but the talks that began Thursday in Rimbo, Sweden, are the first time the two sides have met face to face. The U.N. envoy to Yemen, Martin Griffiths, says the discussions so far been "positive" and with "serious spirit," according to U.N. news. Griffiths, who is tasked with trying to solve a conflict that has created the largest humanitarian crisis in the world, is focusing his efforts on stopping fighting in Hodeidah. The major Red Sea port city is vital for the delivery for almost 70 percent of the country's imports, including commercial goods and humanitarian aid. Saudi Arabia and the United Arab Emirates have been providing air and ground support in Yemen, with logistical help from the U.S., for Abdrabbuh Mansur Hadi's government. The coalition has been partially blockading goods from entering the country, and in June, it launched a full scale attack on Hodeidah, which they say is the main gateway for weapon shipments to Houthi rebels from Iran. Aid groups say the ongoing assault on Hodeidah has exacerbated the humanitarian situation in Yemen. As NPR reported in June, "Yemen is heavily dependent on imported food, fuel and medicine that come through Hodeidah port. 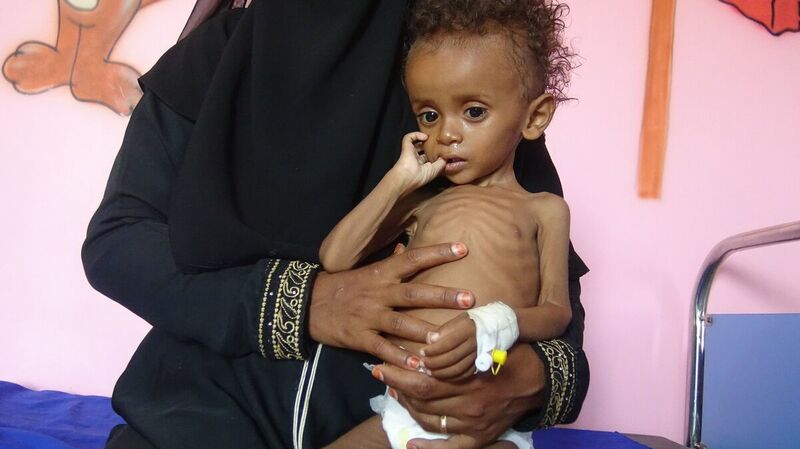 Civil war and a Saudi blockade of the port have driven parts of Yemen close to famine. Cholera and other diseases are rampant." U.N. aid chief Mark Lowcock said in late October that half of Yemen's population — around 14 million people — could soon be on the brink of famine. "There is now a clear and present danger of an imminent and great big famine engulfing Yemen ... much bigger than anything any professional in this field has seen during their working lives," U.N. aid chief Mark Lowcock said. Lowcock also warned against the spread of disease: "The immune systems of millions of people on survival support for years on end are now are literally collapsing, making them – especially children and the elderly – more likely to succumb to malnutrition, cholera and other diseases." The U.S. has been criticized for continuing to offer logistical support and weapons sales to the Saudi coalition. As NPR's Greg Myre reports, lawmakers in Washington have been pushing back against the White House. "I cannot support arms sales to Saudi Arabia. The war in Yemen has gotten out of control," Sen. Lindsey Graham, R-S.C., said recently." The Senate voted last month "to advance a resolution to end U.S. military support, which includes arms sales and intelligence sharing," Reuters writes. But on Sunday, according to the news service, a State Department official said the U.S. wants to continue its support of the Saudi-led coalition in the Yemen conflict. The U.N. brokered peace talks at the secluded Swedish castle are expected to continue for at least another few days. Meanwhile, Norwegian Refugee Council President Jan Egeland tells NPR's Michele Kelemen that pressure must be put on proxy powers the UAE and Saudi Arabia. "[The] U.S, U.K., and France must give a unanimously blunt message to Saudi and the Emirates, those are the two," Egeland said. "It's over. You cannot continue this military campaign. It's been a total failure. And it's been a total devastation for millions and millions of Yemenis."